Welcome to the five hundred and fifty-three of my blog interviews with novelists, poets, short story authors, biographers, agents, publishers and more. 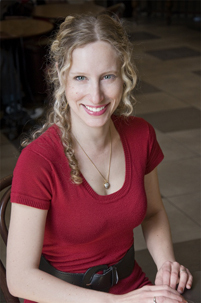 Today’s is with romantic comedy author Samantha Stroh Bailey. A list of interviewees (blogged and scheduled) can be found here. If you like what you read, please do go and investigate further. Morgen: Hello, Samantha. Please tell us something about yourself, where you’re based, and how you came to be a writer. Samantha: Hi, Morgen. I was born in Toronto, Canada, and after living in Montreal, Quebec for many years, I came back to be closer to my family. I have been writing since I could first pick up a pen. I even submitted my first manuscript, Freddy the Flame, to publishers when I was ten years old. Though it was rejected, I knew I had found something that I was absolutely passionate about. I continued to write during high school and university, but it wasn’t until I did my Master’s degree in Applied Linguistics that I started writing novels. I wrote four novels while teaching ESL to adults and having my two kids. After the birth of my daughter, my second child, I decided to stop teaching and opened my own freelance writing / editing business: Perfect Pen Communications (http://www.perfectpencommunications.com). Now, I get to be with my kids and write and edit—all a dream come true. After seeing how traditional publishing had changed, I turned to magazine and blog writing, and then, I finally got the courage to self-publish Finding Lucas. Morgen: Being a full-time writer is a dream for many. I bit the proverbial bullet, quit my job, left in March and got two lodgers to pay the bills. I do feel like the pauper writer but I couldn’t imagine going back to a day job even if it means ‘working’ pretty much all day every day, it doesn’t feel like work. 🙂 What genre do you generally write and have you considered other genres? Samantha: I normally write romantic comedies because I love to write about quirky and funny characters who are struggling with their relationships. But, I have been toying with the idea of writing a mystery. Morgen: Ooh do, they’re great fun, or better still write a quirky, funny, romantic mystery. 🙂 What have you had published to-date? Do you write under a pseudonym? Samantha: I have had numerous articles and blog posts published both in print and online. I write for magazines, websites, newspapers, blogs – basically anywhere I can. I don’t use a pseudonym, but I have used variations of my name: Samantha Stroh, Samantha Bailey and now, Samantha Stroh Bailey. Morgen: A great name. 🙂 You’ve self-published, what lead to you going your own way? Samantha: After I wrote my first novel, which wasn’t Finding Lucas, I managed to land a prestigious New York City agent quite quickly. Knowing that this was a pretty hard feat to accomplish, I immediately dreamt of that call from publishers and movie producers saying they all wanted my novel. Well, a few years and many rejections later, I was still waiting. And though the rejections always mentioned my writing ability and how much they liked the story, I knew that traditional publishing had changed. Publishers were wary to take on new voices. So, I wrote three more novels. Finding Lucas was my favorite because I loved the characters so I decided to publish it first. Morgen: Is Finding Lucas available as an eBook? How involved were you in that process? Samantha: My book is an ebook, but the paperback version will be available soon, and I’m so excited to hold my book in my hands. I might lovingly caress it for a few hours! I’ve been involved in the process every step of the way, but I outsourced a lot of things I knew I needed to, like cover design, formatting and editing. Even though I’m a professional editor, I couldn’t edit my own book as well as it needed to be done. Morgen: None of us can, we’re too close to it. Apart from anything else, a second opinion will often come up with some great suggestions. Do you read eBooks or is it paper all the way? Samantha: Once I’d made the decision to put Finding Lucas on Kindle, I ordered one and started using it. I’ll be honest, I never thought it would happen, but I read ebooks much more than paperbacks now. I love the ease and portability of the Kindle, and it’s amazing to order a book and have it immediately. Morgen: Isn’t that great. I love having the choice. Do you have a favourite of your stories, books or characters? Samantha: Finding Lucas is my favorite book because I love the character of Jamie. I think she has so much strength to change her life and finally leave such an unhappy relationship. She is insecure and reserved but works very hard to overcome her challenges and discover her self-worth. I think she is relatable to so many women because we have all felt less than at some point in our lives, and we all struggle to find our place. I also love Andrew because he is loosely based on my husband. Morgen: Wednesday night’s author spotlight was from a lady (Michelle Taylor) who’s written about getting out of tough relationships. It makes very thought-provoking reading. If any of your books were made into films, who would you have as the leading actor/s? Samantha: I love this question! Samantha: I think Finding Lucas would make a great movie! I can see Emma Stone or Ginnifer Goodwin as Jamie and John Krasinski is a shoe in for Andrew. For Hanna, I can totally see Megan Fox in the role. Derek is a cad, and the role would have to go to Bradley Cooper. I’ve thought a lot about this! Morgen: Great choices. I’d go and see it. 🙂 Did you have any say in the titles / covers of your books? How important do you think they are? Samantha: I had complete creative control, which is both wonderful and stressful. I think the title and cover are extremely important. The title came to me very quickly, but the cover took a while to create. In fact, I have changed the cover for paperback because I wanted to try something different, and I’m so happy with the result. Carlo Carosi, my paperback designer, is a genius and very patient. Samantha: Running a writing / editing business means I’m always writing something—magazine articles, blogs, web content, etc. But when I’m not working, I’m rewriting Everything But, a women’s fiction genre about Maddy Taylor, a woman who never wanted kids… until she does. Her husband isn’t quite on the same page, and the novel is about her struggle to save her marriage and have a child. Is it possible to have everything you want without losing it all? Morgen: We’ll have to read the book to find out. 🙂 Do you manage to write every day? Do you ever suffer from writer’s block? Samantha: I write every day. I am so passionate about writing and would feel lost without it. I can’t say that I’ve suffered from writer’s block, but I certainly struggle with sections of the books I write, especially sad ones or parts that affect me personally. Morgen: I say I don’t suffer from writer’s block (I have more ideas than I can cope with) but I’m sure every writer out there has hit a wall on some of their pieces. I take a break, do something else, and invariably I can see what’s missing when I come back to it. Do you plot your stories or do you just get an idea and run with it? Samantha: I get an idea and run with it. I do make a general outline of the plot and the characters, but then I just let myself write. I stop myself from editing or changing anything until I feel I have some story to work with. And I find that my characters tend to take over the story! Samantha: I generally name my characters what I would name my children if I were to have more. I scour baby name websites, and I also try to match the physical and personality traits of my characters to the names I think suit them. Morgen: Baby name sites and books are the most popular source by far. Do you do a lot of editing or do you find that as time goes on your writing is more fully-formed? Samantha: I do a ton of editing. A writer friend once gave me great advice. He told me that the sentences I thought were the most brilliant and hilarious probably weren’t and to cut them. I have found that helps a lot. I have cut out scenes and chapters, and as a professional editor, I edit on the sentence level a lot, too. Morgen: Ouch, that sounds painful, but if the story is better for it… What point of view do you find most to your liking: first person or third person? Have you ever tried second person? Samantha: I like first person because I think it helps the reader relate to the character. But, I might try third person for my third book. Tom Robbins’s novel, Half Asleep in Frog’s Pajamas, is the only book I’ve ever read in the second person. It was disconcerting at first, but I quite enjoyed the style by the end. But, I don’t think I would attempt it. Also, my genre is romantic comedy and women’s fiction, and I’m not sure that second person suits the snappy, fast-paced writing I like to do. Morgen: I think you’re right. I write a lot of it and they tend to be dark… but that could just be me. 🙂 ‘Half Asleep in Frog’s Pajamas’ sounds hilarious (I love quirky titles). I’ll have to look out for it. Have you had any rejections? If so, how do you deal with them? Samantha: I have had many rejections. My very first rejection from a publisher broke my heart a little. Mind you, I was ten years old. Since then, I’ve realized that not everyone is going to like what I write and everyone is looking for something different. I have never and will never let rejection stop me. I really think success comes from doing what you love, persevering and trying again and again. Morgen: Absolutely. If you love what you’re doing, you keep going. How much of the marketing do you do for your published works or indeed for yourself as a ‘brand’? Samantha: I do almost all of the marketing myself, and it’s so hard. Putting myself out there was a bit scary at first, but if I’m really going to be a successful author, I know I have to do things that might make me uncomfortable. I lucked out and found an incredible group of authors, bloggers, reviewers and readers whose warmth and support have helped so much. And indie authors promote and celebrate each other’s successes, and I’m so grateful to my group of indie author friends. Morgen: Me too, as I’m sure without them (I’m one too), I’d be scrabbling around for guests. 🙂 What’s your favourite / least favourite aspect of your writing life? Has anything surprised you? Samantha: My favorite aspect of my writing life is getting completely drawn into my stories and characters. I love creating people who become real, and I love seeing how their stories unfold. My other favorite is the amount of people who have said they love Finding Lucas. That means the world to me. What has surprised me is how much work it is to promote a novel. Amazon is the biggest bookshelf in the world and getting noticed requires me to constantly promote the book. But, I am also surprised by the resources out there. Morgen: Sweet and sour, but then the harder it is to succeed the better it feels when you do. What advice would you give aspiring writers? Samantha: It might sound trite, but my advice would be—don’t give up. If you love to write, do it. Most people think they could never write a novel, but if you have a great idea and you love how words flow together, it’s a fantastic start. My other piece of advice is to network. I met most of the reviewers, bloggers and authors I know on Twitter and Goodreads, and for a former technophobe, it was very daunting, at first, to connect with people and not feel like an idiot. But, finding them has made my career as a writer so rich, and even though I have yet to meet them, they have become very important to me. Morgen: Not giving up is key. They say a successful author is one who didn’t give up and if you did, you’d never know if your lucky break was just round the corner. Is there a word, phrase or quote you like? Samantha: I love the word discombobulated. I’m not sure if it’s an official onomatopoeia, but it feels like one. I think it perfectly describes a mix of confusion, stress and bewilderment. Morgen: I’d say bewilderment would certainly be onomatopoeic. 🙂 Are you involved in anything else writing-related other than actual writing or marketing of your writing? Samantha: As a freelance writer / editor, I publish articles and blog posts on relationships, parenting, family, finance, food-you name it and I write it. I create web content and dating profiles, edit academic papers and business communication. I am so lucky to be able to write fulltime. Morgen: Maybe you could do me a writing-related guest blog? What do you do when you’re not writing? Any hobbies or party tricks? Samantha: I run after my amazing kids. Morgen: I’d say that probably counts as a party trick. 🙂 Are you on any forums or networking sites? If so, how valuable do you find them? Samantha: I am on quite a few forums and networking sites, and they are immensely helpful. Writing can be a lonely endeavor so connecting with other writers who are as passionate as I am about what we do is great. I actually found you on a networking site! Morgen: Ah, probably LinkedIn. Where can we find out about you and your writing? Samantha: You can check out my blog http://samanthastrohbailey.blogspot.ca and my business http://www.perfectpencommunications.com. You can also visit my Facebook author page: http://www.facebook.com/pages/Samantha-Stroh-Bailey/420736011289684. I am also on twitter: @perfectpen and on Goodreads: http://www.goodreads.com/author/show/5832614.Samantha_Stroh_Bailey. 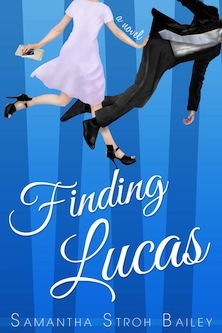 You can find Finding Lucas at: http://www.amazon.com/Finding-Lucas-ebook/dp/B007VIIU6A. Samantha: I’d like to say thank you for this great opportunity. It is very difficult for indie authors to make a name for themselves and every bit of exposure helps. Morgen: You’re very welcome. I hope it does. Is there anything you’d like to ask me? Samantha: I’m sure you get asked this all of the time, but why did you decide to help other authors? Morgen: Occasionally, yes. I’d heard a blog was a good thing to do and at the time (March 2011) I was doing in person / Skype audio interviews for my podcast which took ages to record and edit. Not long after I set up the blog I was invited for an email interview and I quickly realised it was a much better tool than the audio interview, plus I was able to do one a day rather than one a fortnight. I’m currently booked up to next July at one a day so imagine that at one a fortnight. 🙂 Thank you, Samantha. I look at her shiny face flushed with excitement. And for a second, I get a taste of that excitement. And I like it. Time and time again, I somehow find myself jumping on the Zany Lucy Bandwagon, and every time, it’s a disaster. Once she thought it’d be great if she, Hanna and I went to Las Vegas on a whim. I ended up with food poisoning, heatstroke and minus the $500.00 that was given to the blackjack dealer. “Who’d know? You’ll be using the phone and fax anyway. It’s not really using their money. It could be an adventure.” Lucy’s eyes flutter up and down, creating spidery shadows on her cheekbones. And now, thanks to Lucy, the idea sets in my head like a bad song, and I know full well that it’s never going to leave. But this Lucas idea is just too ridiculous. Chasing down my high school f**k buddy. Please. No, I can’t do this. How would I feel if Derek went to find his ex-girlfriend? Although they all sound like frigid ice queens from what he’s told me about them. The type of girls who “debut” and wouldn’t stoop to sullying themselves in the backseats of rusted cars. But maybe it’ll make me realize why I love Derek. Like comparison shopping. Samantha Stroh Bailey has been a writer ever since she could first pick up a pen. In fact, she even sent her first manuscript, Freddy the Flame, to publishers when she was ten years old and received her first of many rejections.